Lots of questions come up on what oil filter I should be using on the Cummins B or QSB 5.9. Below is what I can share based on using and working with this engine since 1985. Every 4B & 6B & QSB 5.9 series Cummins I have ever come across uses a 1 x 16 TPI thread for the oil filter. My 1995 Dodge with a Cummins 5.9 was the same. If there is an odd ball engine out there, it has not come across my desk yet. As to the filter number you use, there are options available, but all of the premium units can be used on the more generic industrial & low HP versions of the B’s. The LF3894 is Fleetguard’s premium Stratopore oil filter and can be used in any B series application where superior oil filtering is wanted. 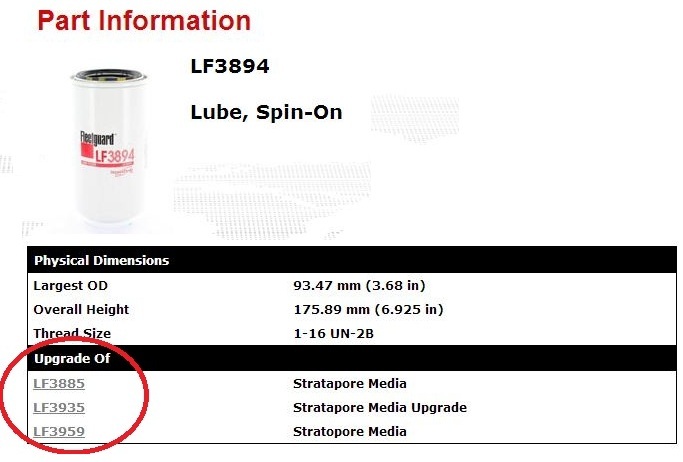 Cummins Mercruiser Diesel (CMD) released a cautionary bulletin years back about using the LF3894 on the early QSB’s due to a potential pressure drop because of the remoted oil filter and the small lines feeding it. I personally never saw the issue, but CMD did redo the oil lines in 2003 or 2004. 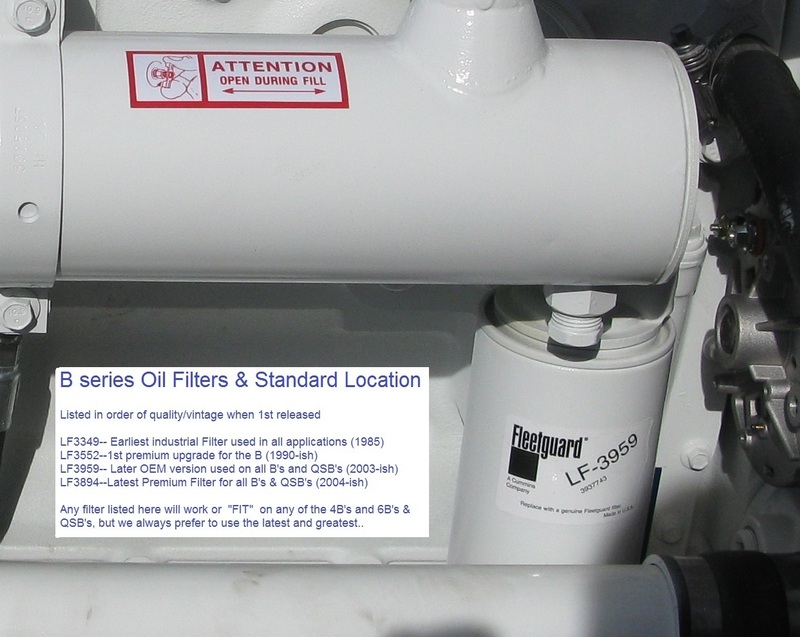 Cummins Fleetguard continues to recommend the LF3894 for the QSB & all of the B’s as their best oil filter option. As to what oil filter? – That’s your call but we always prefer the premium option by Fleetguard. 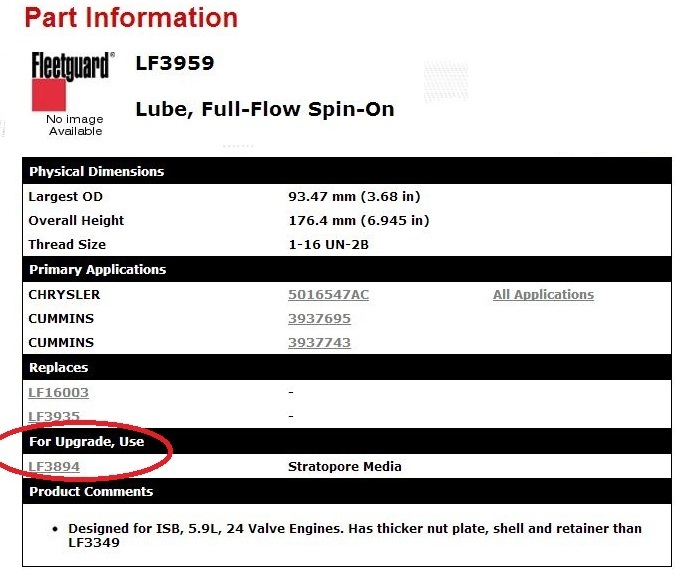 And last – I just looked up the new QSB 6.7 and Cummins Fleetguard engine spec-ed out the same LF3894 oil filter as the premium option.